Standing on a wobbly kitchen chair to reach the mixing bowl, apron wrapped twice round my middle and my tongue taking a snatched opportunity to explore the rough texture of a well-used wooden spoon: food memories. While cooking can sometimes be reduced to just feeding, small people around your ankles as you try to cobble something edible together, baking is always different. It’s a luxury, an indulgence, a search for lost times – that warm childhood kitchen – through the flavour of vanilla, the sensation of leafing through an old cookbook, the texture of a cake batter as you stir. It’s also an effort to claim those memories for the next generation, to give our own children a safe base from where to fly. When Aoife Carrigy asked me to contribute to a For Food’s Sake event entitled Food Memories: a taste of personal palate-shaping experiences, the question was: what memory to choose? In the end, via the good (roasting field mushrooms on the Aga at my Nana’s house) and the bad (being made to sit for endless hours in front of plates of potatoes), I got to the formative: baking our family favourite Porter Cake with my mother from the McDonnells First Good Food Cookbook by Paula Daly. 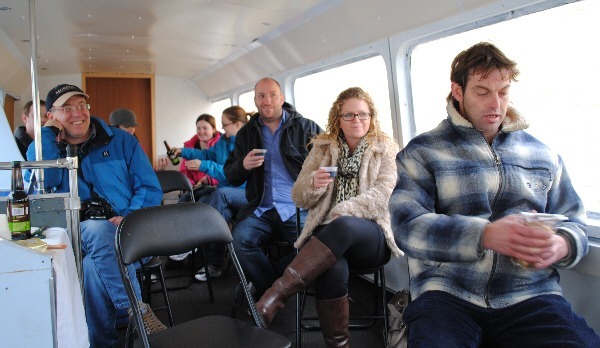 On the top of the Big Blue Bus on a sunny afternoon at this year’s Dingle Food Festival, I brought the memory full circle. These days, it’s always the Kiwi’s Eight Degrees Brewing Knockmealdown Stout that I use in the cake so we had the sound of the bottle opening, the rich nutty scent of roasted barley, warm aromas from Green Saffron mixed spice and – unlike when I was a child! – we had the beer to taste. 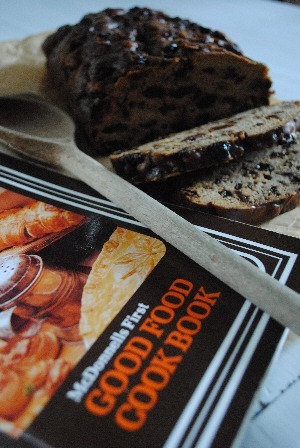 The precious cookbook was there to look at and we had hunks of Knockmealdown Porter Cake to eat. Making food memories, and passing them on. There’s always an air of giddy anticipation about the Dingle Food Festival, especially in the run up to the announcement of the Blas na hEireann award winners. A special congratulations this year to Cork pie-maker Úna Martin, winner of the Bord Bia supreme champion title award. But you don’t have to be involved in the awards to enjoy the event, with plenty of workshops, demos and especially the brilliant taste trail to check out. This year, a €20 book of tickets allowed you access to 64 stops around town, with restaurants, jewellery shops and art galleries offering tastes of everything from fast fishy treats, Sloeijto cocktails, Lorge chocolates, scoop-your-own Murphy’s ice cream and – so good I was back there twice – raclette from Maja Binder’s perfectly formed Little Cheese Shop. At this year’s festival I was a guest of Blas na hEireann. Try your own local favourite porter or stout in this – I use Knockmealdown Stout – but other good options are Dark Arts Porter, Porterhouse Plain or O’Hara’s Irish Stout. If you can get your hands on it, Cork’s Green Saffron do a fantastic mixed spice that’s well worth seeking out for this cake. Makes 2 x 900g loaves. Preheat your oven to 160°C (140°C fanbake) and line 2 x 900g loaf tins with greaseproof paper. Put the porter, sugar and butter into a large saucepan, put over a medium heat and, stirring regularly, dissolve the sugar and melt the sugar. Allow to come to the boil, then add the dried fruit and mixed peel and simmer for 5 minutes. Remove from the heat and tip into a large bowl so that it cools quickly. In a separate large bowl, sift the flour, bread soda and spices together. Make a space in the centre. Stir the eggs into the cooled fruit/porter mixture, then add the dry ingredients. Mix well. Divide between the two tins and bake in the preheated oven for between 1¼ and 1½ hours until the cake feels springy and a skewer comes out clean from the centre. Adapted from McDonnells First Good Food Cookbook by Paula Daly. You’re totally right, Carolann! Thanks for letting me know. It’s 575g of plain flour – now updated in the ingredients list. You dont mention when to add the eggs, I beat them and added them to the last half of the cooled fruit and mixed well. Its in the oven now and smells divine! Duly noted and edited! Thanks for letting me know, Margaret. Hope you enjoyed the porter cake as much as we always have. For years it was even used as our Christmas cake! That porter cake was eaten before it had time to cool! Since then I have cooked three more basically from your recipe with a few ‘tweaks’ (just to be different)! I added extra fruit and pecan nuts in the last one yum! I like the idea of heating the fruit with the porter, really plumps up the fruit. Have one in the oven now (same recipe) but a kilo of mixed fruit inc mixed peel. I thought I would make it Xmas eve but no time, so I threw some brandy to plump up the mixed fruit, last night I put in 1/2 pt porter and this evening the fruit had absorbed all the porter so I put in another 1/2 pint! It is now out of the oven and cooling down, will let you know later how it turned out! That sounds gorgeous, Margaret! I’m a big fan of tweaking recipes about, as you may have noticed, and love the idea of adding the pecan nuts. I think one of the reasons that I like this cake so much is because of the plump, juicy fruit – makes it keep really well as a result. Although I’m not sure if you’re having any success at keeping it for any length of time! Does anyone know how I good get my hands on a mcdonnells good food cook book? It’s fir my grandmother who lost hers and misses it terribly. Charity shops are the only places that I’ve found copies, Lorraine. As far as I know, the books haven’t been in print for decades. Are there any particular recipes that your grandmother is looking for that I could send on to you?